The first and only female Sultan of the Delhi Sultanate, Sultan Razia is furious. Someone’s sending her the peskiest presents possible: poems on sultanas, girly dresses and palkhis amongst other things. Who is the pest behind these annoying gifts? And will the Fabulous Forty be able to solve this mystery? Did Razia insist on being called Sultan and not Sultana? Did she defy social customs that existed at the time for women – in her dress and travel arrangements? Was there really a group of forty men loyal to the Sultan? 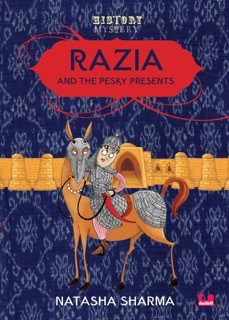 Read Razia and the Pesky Presents and find out for yourself in a riveting mystery. Sizzling ears, twitching nose and pesky presents.